Really impressive^^ You did a great job with lines, I like the style of the background! 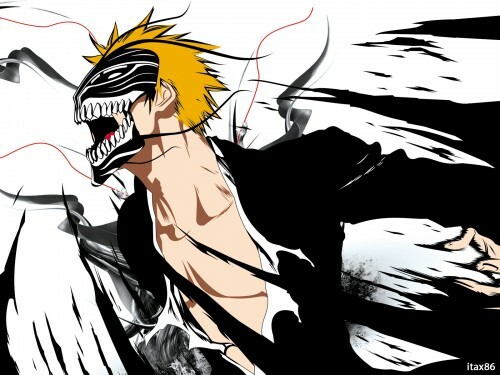 truly amazing i love ichigo with the mask! i think no, but i just vectorize from manga, so i really don't have any thought like that, hahaha..
That's cool. :D I think it's quite striking with no outlines in the vector. I'd love to see something like this as a wall scroll... I'd buy one in an instant. This scene in the manga caught my attention right away. Thank you for making it into a wall like this. It's clean and sharp but the wispy line and grey parts do come off a little strange (like they are not suppose to be there). Nevertheless, I'm getting it. THanks! Yea this is good. I love how the the dark and light colors from the shadows and his body conflict. But you missed his hand. It looks so different from the rest of his body. It really is beautilful. I like how Ichigo looks, raw and somewhat in pain. Or at least I think that. Anyway I also liked the red "threads", at first they looked out of place, but once you've watched the wallpaper for a longer time I relized that if they weren't there something would be missing. So that was a good way of adding that little "something".